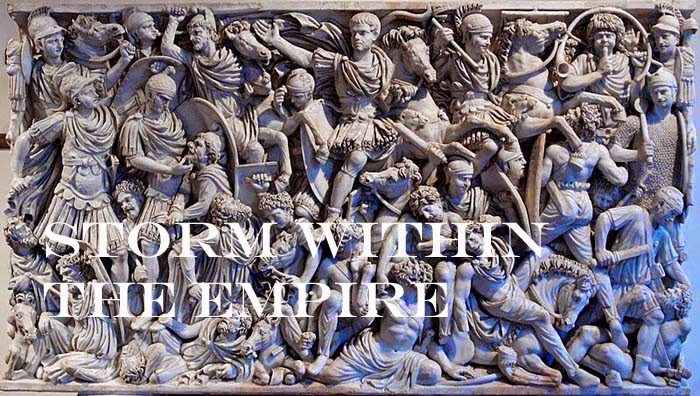 Storm within the Empire: Project Rome – Spanish armies in battle array. Project Rome – Spanish armies in battle array. The Iberian, Celtiberian and Lusitanian armies are complete and ready to do battle against any consular army foolish enough to wander into the interior of Hispania. This is the nice aspect of maintaining a blog as a form of documentation as I read when these projects start and when collections are completed. This project began on the first of May and four weeks later Sometimes I surprise even myself during these spurts of painting; eight days – four armies. The sub-list for the Iberians offer either the 3Ax or 4Ax option and rather than debate which to select a collection was made for both. There are many collections and illustrations to be found on the Internet and I decided to paint the Celtiberian in “dazzling white” and the remaining three in muted earth tones. The shields were painted in similar tones of browns, orange and scarlet. In the Macedonian and Punic War book by Duncan Head, the Celtiberian were noted for their white tunics and scarlet/red plumes. The shield pattern was kept simple, two colour blocked off with white or black line and no lozenge pattern. This gave the 3Bd a business like appearance. These should have the smaller round shield and were the result of hurriedly placing an order before reading the book, but they are organized as per the Lusitanian sub-list and will be put through their paces until such time a replacement order will be made. These will be re-based as a third Iberian army when that moment arrives. Next week, I can start on a few terrain pieces. Look great! The Spanish were tough opponents for the Romans, though their resistance doesn't get the coverage the Gauls do. Reading Livy one has the impression regions fell one after another from Rome’s might, but this is not easily reconciled with the fact that the conquest took nearly two centuries to complete. An alliance between the tribes was virtually not possible as they were likely to be attacking one another than fighting Roman troops. We do read of tribes that served as mercenaries for Rome, but these may have cooperated earlier when Carthage ruled those regions. In the coming weeks, I will give the campaign a good test and do a full write up.